Last night Nate jumped on Skype along with the rest of the DS crew and I realized just how long it was since I’d recorded a podcast. Back in the day we use to record using a program called HotRecorder but that was windows based so I tried to give Audacity a shot. Boy did the cause problems. Ended up wasting 2 hours on trying to create mp3 only to put the project files on a flash drive and take into work to use a windows machine. That’s in the past and I’m sure you don’t want to hear about my complaining. What really got me thinking was talking to Zampzon again. Realizing I should find a way to put him into the comic. Do I make him some arch villain that’s always making fun of my stutter? Perhaps have the DSA crew visit the old comic in some kind of surreal adventure? It’s also a golden opportunity to revisit some of the pain Zampzon inflicted on my character, if only Jason will oblige when he draws up the comic. I want my process for bringing this comic from concept to finished product to be as transparent as possible. Whether or not anyone cares or reads about it is in up in the air. Just the same, here’s a look at how Page 2 is coming along thus far. We’re delving into the occult with this one (which, I discovered, will get you followed by various occultists on Twitter within seconds) and it’s my first time drawing tarot cards, so be gentle! Couple of panels of Midnight in street clothes being pulled around by a girl. 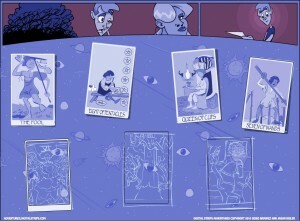 The girl sees a sign for tarot reading. Girl: O-M-G! I’ve always wanted a reading. Girl: You’re no fun, please! The girl gives Midnight a pouting face causing Midnight to roll his eyes. Midnight: Fine, but no crying! Midnight gets pulled in. Show a panel stretching across the page with the two going in through the doors into an anteroom, a waiting room in the middle, and a third room with an old woman sitting at a table. Bottom of page has the girl sitting at the table all happy. Midnight looks confused and the girl has a shocked look on her face. Old Woman: but this twit of a girl is his way. See? I try to be all artistic and stuff and Midnight goes and it makes good. Go figure. You thought I disappeared, didn’t you? Well the winter ‘storm’ barreling down on the south better be HUGE. I’ll I here about is that this town and that town is going to get snowed in. This is a place that the worst snow in the past 50 years was 6 inches. So the problem isn’t going to be the snow in so much as the idiot drivers who can’t drive in a drizzle but think their SUVs can drive on ice. Anyways episode 4 brings in a whole new concept then we’ve previously explored before. The most obvious difference is the framing, but maybe it’s the coloring? Either way it’s part of the whole experiment in exploring everything that is webcomics. This change, though, brings to mind many questions about why people choose one format over another. I like to think the laughs you get from reading Imagine This are equal to the jokes we used in Captain Excelsior but we have to admit the delivery is completely different. The short banner like gag strip immediately puts the reader in the mode for laughing because very few of us can think of a serious comic that uses the one line horizontal layout that isn’t trying to be funny. The full page, on the other hand, is historically the realm of graphic novels, even if it gives artists more room to set up a joke. Your audience may or may not be ready to see some slapstick or witty pun, if delivered 6 panels further than normal. So what is the better presentation?